OMG, looks like an eternity passed by since the events a couple of weeks ago! I'm very sorry about disappearing from the blog (and almost all social life) this way, but since I came back to Italy I've been working as the craziest thing in this world with my flatmate to get done all the exam material we were taking past Thursday. We finally delivered it (even though it was an exam, it worked as a regular exposition, with printed boards and a couple of scale models, and so on) and we even got a great grade, but I will always remember the very tough couple of weeks we've had and how we carried two scale models (one of them being almost 1,5m long) and 8 DIN A-0 boards rolled up in my backpack all the way through the Piazza del Duomo. Anyway! In today's outfit post I wanted to share with you one of the very few looks I shot when I came to Spain for Christmas Holidays. You know, when you're studying away from home even though it's only for a year, everybody wants to meet with you, have a couple of drinks with you and everyone expect you to do a huge recap on your life since you arrived to Firenze. And that makes shooting pictures for a blog, or even stopping by at home nearly impossible! As it's a tradition for my family to gather up and have lunch together every 1st of year, I decided this was the right moment to finally use for the first time this vintage Dior little black dress I bought a couple of years ago, and which was waiting in my closet for the right time and event to wear it. I can't even remember where I found it, but I do remember that I instantly fell in love with its silky touch and the super simple but sophisticated shape with the draped silhouette and the bow at the hips. 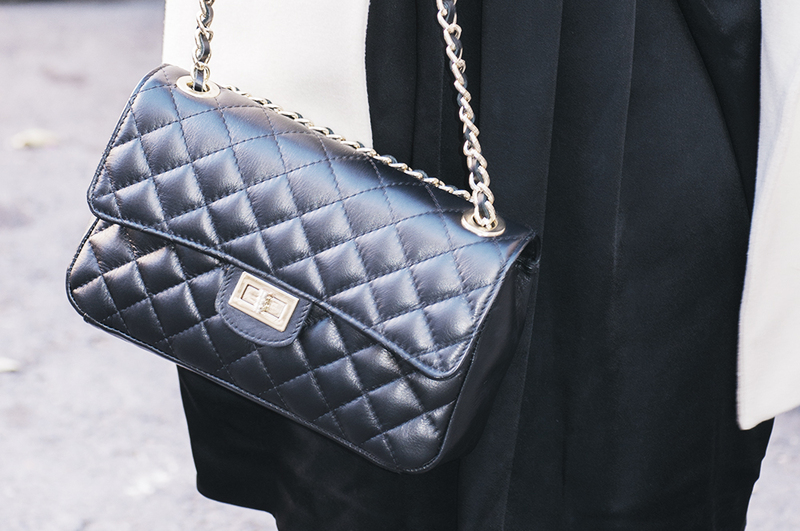 You already know: I can't resist a timeless, classic vintage piece. 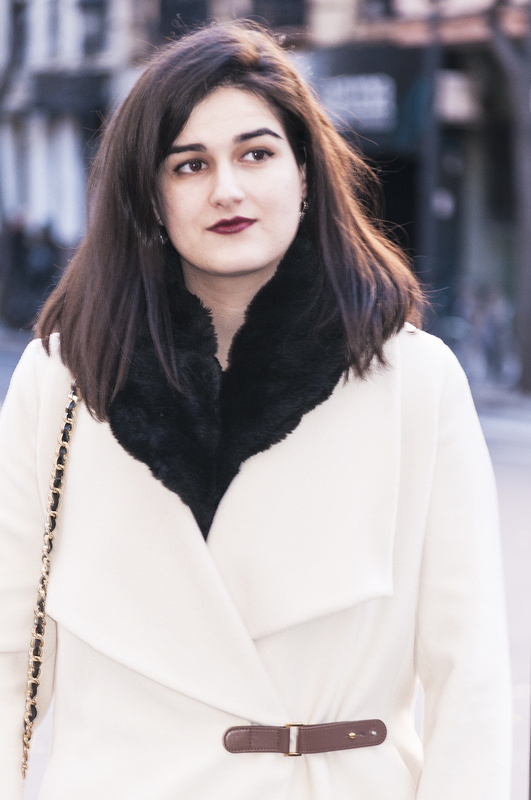 My advice when wearing this kind of super iconic pieces that speak for themselves? 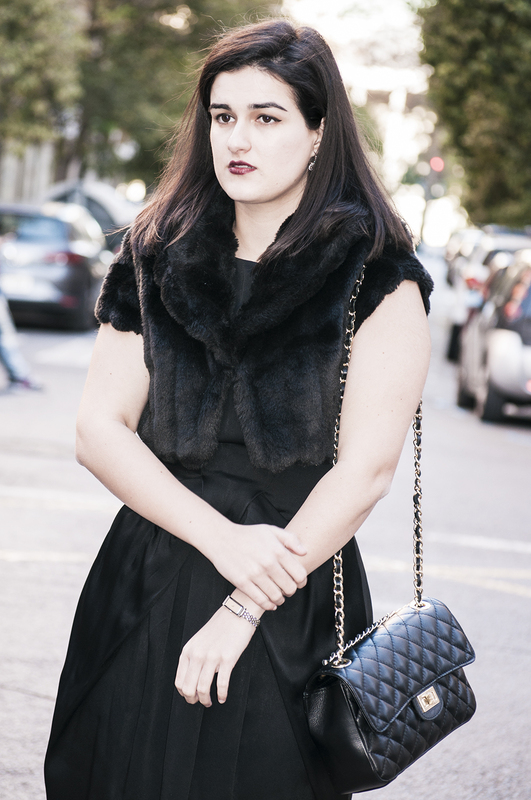 Well, apart from taking a quick look at some of my vintage-related posts, I do think that the best thing you can do to style a vintage dress like this LBD, is to match every other extra piece and accessory around it. Let it be the main character in your outfit. And, if you want to mix different vintage pieces like I did here (because now that I realize, OMG, almost everything I'm wearing here came from a thrift-store or vintage showrooms) is not to mix too much colors or patterns. Instead, play with the textures and shapes (see? Fur jacket, lace shoes, leather bag. But still, everything is black!) to achieve a clean and very cohesive total vintage look without looking too costumery.